When I was a kid, I wanted to be an animator. I grew up watching Disney animated films and Saturday morning cartoons. The hand-drawn characters in these movies and shows expressed their unique personalities with simple gestures, their contours acting as subtle signatures of the artists who drew them. I’d relish anime series finales where the creators seemingly spent their entire animation budget to multiply the number of frames in key action scenes. The fluidity of motion, combined with the knowledge of the labor that went into producing them, made for dazzling displays, even when plots fell flat. Nothing against computer generated animation or pixel art, but sometimes I miss the unique aesthetic qualities that come with hand-drawn animation, which has become all too rare. When I first booted up Wonder Boy: The Dragon’s Trap, I couldn’t stop staring at my character’s basic movements. Walk, crouch, sword thrust—each is lovingly animated from hand-drawn frames in an enthrallingly smooth and vivid manner. The character designs are right out of an adventure-filled Sunday comic strip. The protagonist, sporting a colorful cowlick and a look of determined optimism, traverses a slate of stereotypical videogame areas (jungle, castle, desert, etc.) that nonetheless set the stage for a lighthearted romp. When you enter a shop, the outlines of the characters vibrate as the contours cycle through multiple drawings of the same pose, creating an illusion of idle motion. A snarky, smoking pig will sell you a better sword, then lament that he should have charged more. Perhaps the look of Wonder Boy just scratches an animation itch for me, but generally speaking, games don’t look like this, much less remakes of Sega Master System titles. Wonder Boy: The Dragon’s Trap is a remake done right, executed with a style that is both loyal to its source material and singularly evocative on its own. This new Wonder Boy is indeed a remake of Wonder Boy III: The Dragon’s Trap, originally released in 1989. You play as Wonder Boy or Wonder Girl (she’s new to the remake) off to slay a dragon, but you end up getting cursed instead. Our Wonder Hero is turned into an anthropomorphic lizard and must set out to return to human form by taking down the monster behind it all. Along the way you are transformed into other humanoid animals, each with their own abilities and weaknesses, and must slash and burn a path through a non-linear world to lift the spell cast upon you. Wonder Boy: The Dragon’s Trap has the expected HD rerelease updates (widescreen display, higher framerate, etc. ), but the visual overhaul, plus the ability to switch to or mix and match retro graphics and audio on the fly with no interruption in play, adds value to the title both for players looking for a new game or a historical curiosity. Switching between contemporary and vintage graphics may seem like a simple novelty, but it gave me a deeper appreciation of both art styles by having them so easily juxtaposed. I swapped visuals every time I entered a new room, genuinely curious as to how the game originally looked, but also to investigate where the remake’s artists drew inspiration. Wonder Boy: The Dragon’s Trap is a museum as much as it is a game. It was pretty common for games in the ‘70s and ‘80s to have very detailed and elaborate fantasy-book-cover box art that was meant to spur players’ imaginations as to what a bunch of colored blocks moving around were supposed to represent within the games themselves. 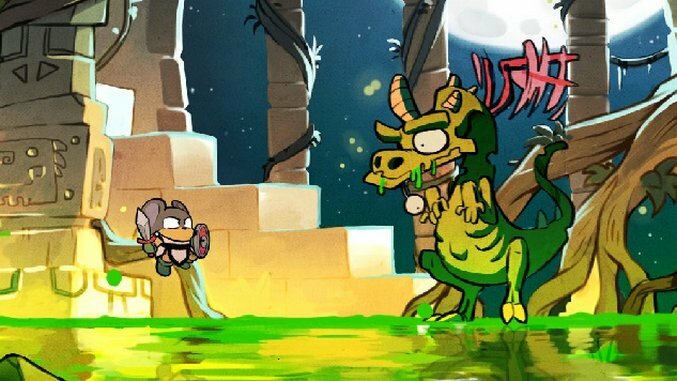 Wonder Boy: The Dragon’s Trap is like that box art has come to life. The original designs, previously relegated to character portraits in the instruction manual are the actual in-game models here. However, it’s the areas where the original game provides almost no details as to what a space is supposed to look like that the artists at Lizardcube find avenues to shine brightest. My favorite instances of these are the side rooms with warp doors for returning to the central hub village. In retro mode, these rooms are plain blue and grey brick hovels and “RETURN” written above the door in a default system font. For the remake, these rooms are positively cosmic, illustrating the fantasy metaphysics at play in a room with a magic teleportation door. The brick wall is gone, and a starry purple gradient implies a celestial expanse. Detached stairways spiral out of view, and a curly neon “Return” sign flickers above the door. The whole scene is reminiscent of the genie’s lamp level from Disney’s Aladdin on Sega Genesis, which coincidentally was also a landmark game in translating hand-drawn animation into videogame form. At this point I’ve talked a lot about the look of Wonder Boy: The Dragon’s Trap, but there’s a game to be played here, too. In that regard, The Dragon’s Trap sets a high watermark for a videogame remake, deftly balancing its modern and historical statuses simultaneously. On its most basic level, Wonder Boy: The Dragon’s Trap is a hard-coded replica of the Master System classic, with its simplified take on the Metroid formula of non-linear exploration. The whole world of the game is technically available to explore from the get-go, but special items and abilities are required to enter certain subsections. Unlike Metroid, you don’t slowly build an arsenal over the course of Wonder Boy. Instead, you’ll spend most of the game locked into the body of one animal form at any given time. You are cursed after all, not a superhero; the beastly abilities each have their corresponding weaknesses that disallow traversal into particular regions. For example, in bird form you can fly over enemies’ heads and access skybound doors, but water hurts you, effectively closing off previously accessible submerged pathways. The Dragon’s Trap isn’t totally unlike other action-adventure titles from its day, but it does effectively put its own spin on the formula. Even with the new coat of paint, under the hood, Wonder Boy: The Dragon’s Trap remains an old game, which applies both to its simple charms and its bizarre idiosyncrasies. On one hand, it’s refreshing to play a straightforward action-platformer that offers this much bespoke variety within a five-hour package. On the other, the checkpoint system is old school brutal in that there are no checkpoints. It’s a tough game at times, forcing you to run through gauntlets of ninjas and cyclopes that bounce you around like a pinball over a magma pit. And when you die, it’s all the way back to the starting area. If you’re lucky you’ll pull a health potion from a continue screen roulette wheel. Otherwise, you should expect to grind plucky cartoon snakes for enough coin to buy better armor and repeat those steps with each subsequent beast form. Your inventory retains its antiquated clunkiness, most evident in the late game where switching frequently between swords and armor with special attributes is a necessary chore. The new art helps assuage some of these redundancies, but for better or worse, leaves the almost 30-year-old core intact. Still, in a world of HD rehashing and the seemingly obligatory impulse to re-render old games with the latest in photorealistic graphics tech, it warms my heart to witness the stylistic human touch of Wonder Boy: The Dragon’s Trap. It’s a splendid homage, a playable history exercise, and an unexpected touchpoint for the expressive potential of hand-drawn animation in 2017. 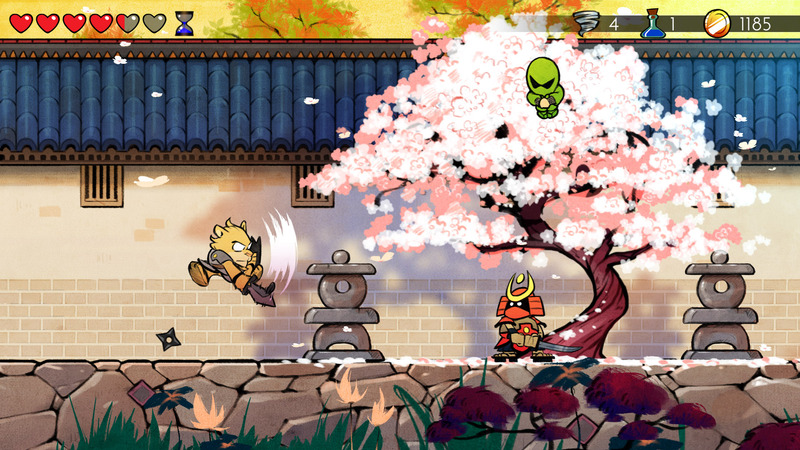 Wonder Boy: The Dragon’s Trap was developed by Lizardcube and published by DotEmu. Our review is based on the PlayStation 4 version. It is also available for Xbox One and the Switch.